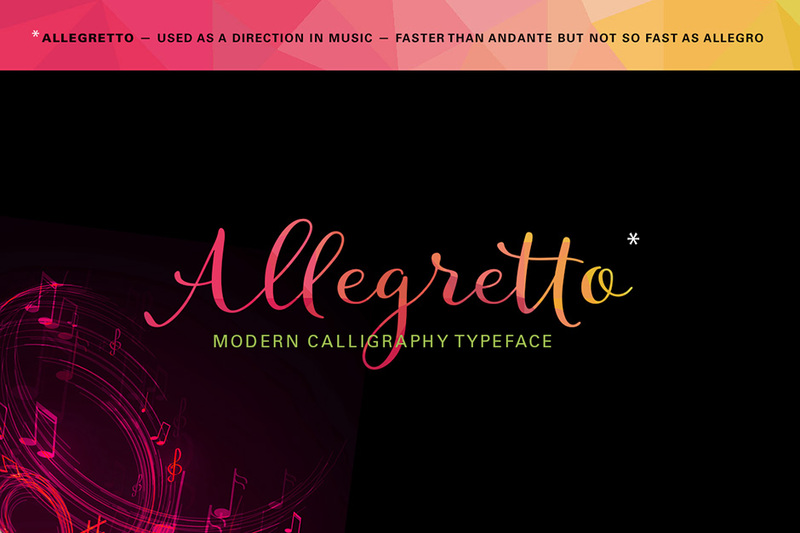 A modern calligraphy typeface with a playful, yet elegant style, inspired by Mozart’s “Rondo Alla Turca” and his other compositions played with an allegretto tempo. The font contains more than 1000 glyphs. Each letter in the typeface has a few different swashes that can be accessed via the glyphs panel of your OpenType-aware application such as Adobe Illustrator, Adobe InDesign, MS Word. Language Support: Breton, Catalan, Czech, Danish, Estonian, English, Finnish, French, German, Hungarian, Icelandic, Italian, Latvian, Lithuanian, Norwegian, Polish, Portuguese, Romanian, Scottish Gaelic, Slovak, Slovenian, Spanish, Swedish, Turkish, Welsh. File size is approx 142.8KB (287KB unzipped), offered as a single download. Thank you! Thank you! Thank you! I cannot wait to use this. Woohoo we hope that you get lots of great use out of these! Thank you very much my apreciate friends! I have Photoshop, Corel Draw and another design softwares! Really great working for me! Wow I was excited last week when we got five freebies. Imagine how much more I’m excited this week with five MORE! Birthdays at DC are always a wonderful time of year. You guys keep growing and changing and I wish many more years ahead for you to continue to develop! Thanks so much for the first of the five freebies. Such a lovely font. Now I need to go and say thanks for the rest of them! Oh wow wow wow. These GLYPHS! THANK YOU x 1,000! Thank you so much for being so helpful and including some instructions of your own! We’re so glad you like it and thank you for your comment! Thank you for this lovely font. I think this is one beautiful font and certainly loaded with extras. I also need help accessing the swashes and ligatures for this font! How do I access them in Microsoft Word? We’re so glad to hear that you love this font and we hope that you get great use out of your new freebie. I’m so sorry to be the bearer of bad news but unfortunately stylistic alternatives require professional design based software, such as Photoshop, Illustrator InDesign and Inkscape so unfortunately these are not compatible with Microsoft Word, our sincerest apologies for any disappointment caused! Beautiful font, Thank you so much! Thank you so much for your comment and I’m so sorry for any confusion caused. The good news is that stylistic alternates require professional design software such as Adobe Illustrator, Photoshop, InDesign or Inkscape so you should be able to find these in your glyphs panel. Unfortunately Corel Draw does not support stylistic alternates so I’m so sorry for any disappointment caused! I’m so sorry to hear that you were experiencing difficulty with your downloads. Rest assured, our tech team were on the case the moment they were in the office this morning and have fixed your links now, our apologies again for any inconvenience caused! The great news is if you log back into your account you should be able to download your resources without any further difficulty and I have popped you over an email to help! The notes and fillagree on the bottom left of the opening image advertising this font – is that part of the glyphs or stylistic background from somewhere else? I’m so sorry to be the bearer of bad news but the stand alone filigree and musical notes graphics that the designer has used in their cover image are not included in this font pack, my sincerest apologies for any disappointment caused Daniel! You’re so welcome Ulrike and we hope that you get great use out of all of your new resources, happy designing! Muchas gracias por la fuente, pero no puedo encontrar los caracteres decorativos y ligaduras, ¿podrían ayudarme, por favor? Thank you so much for reaching out to us and I’m so sorry to hear that you are experiencing difficulty locating your stylistic alternates. Rest assured I have popped you over an email to help! I need help locating the stylistic alternates as well. Thanks! Thanks for reaching out to us and rest assured I can certainly help you further with this and have popped you over an email! I would also like to know how to access the swashes and ligatures please. Thank you for your time. Thanks for your comment and you should find an email from me in your inbox to help! You’re so welcome Bernadette and thank you for your comment! I also need help accessing the swashes and ligatures for this font! How do I access them in Microsoft Word? Thanks for your comment! I can certainly help you out with accessing the swashes and ligatures with this font 🙂 I’ve sent you an email to assist you further with this. I hope it helps! I’m so sorry to hear that you are also experiencing difficulty locating your stylistic alternates, rest assured I can certainly help and you should see an email from me in your inbox!